Spring Showers bring the Sun and Courgette Flowers! As May quickly approaches and the showers from April (as far and few in between as they may have been) are starting to quickly decrease, we are throwing caution to the wind! We are opening up our doors, throwing on our shades and shorts and letting the sangria pour like the nectar of the Gods. We are embracing the glimpses of summer weather that London is throwing our way and running with it. We like to embrace all positive changes at La Farola. The Spring and Summer season is just one of the few that we love to embrace (especially as day drinking becomes much more widely accepted), because there is truly nothing more amazing than sitting outside drinking a glass of our new Rosé Sangria, made with freshly cut oranges, apples and strawberries and some of our fresh tapas. Great choices to eat curb side are our famous Courgette Flowers, our Tender Steamed Broccoli Salad and our extremely fresh Beef Tomato Salad. The Beef tomato is cut and stuffed with thick slices of fresh and creamy mozzarella cheese, and avocado drizzled in olive oil, basil pesto and a sweet pomegranate glaze. Its' simple ingredients but complex flavours will make you swoon and be thankful for the fact you're not stuck inside. We'll see you in sun! 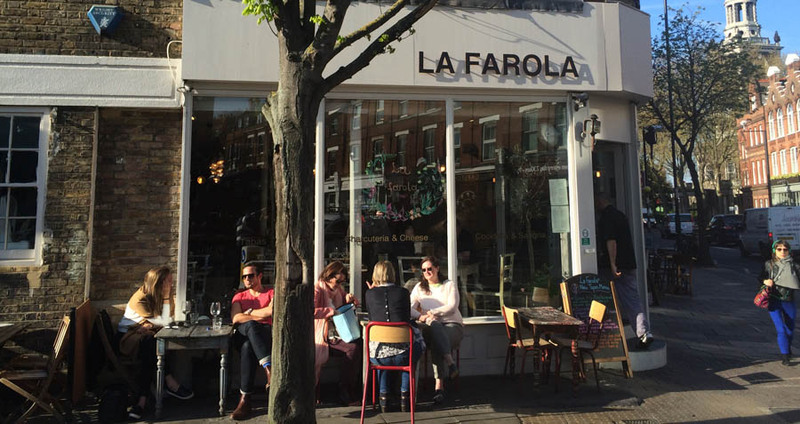 Call us at 020 7359 7707 to book a table or make a reservation on our website using our online booking system at www.lafarolacafe.co.uk.